Everyone has a big fish story—a catch as long as their boat or a behemoth that got away. They’re tall tales delivered with gusto, and while the storyteller will gladly show you just how big the fish was by stretching their palms far apart, rarely do they have anything in the way of actual evidence. This is the sort of story Kokko Kuka thought she was being fed by her ten-year-old son, Cinto. 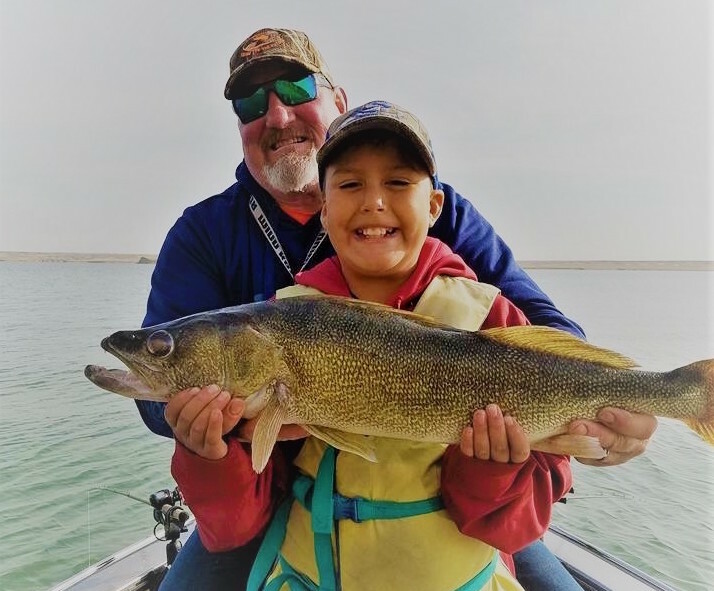 When he came home animated about a “thirty-inch walleye” he caught, she suspected it was a goodhearted exaggeration from an excited young boy. Cinto’s walleye was indeed thirty inches long, caught (fittingly) at Camp Walleye in August 2017. The camp, sponsored in part by the Great Falls Chapter of Walleyes Unlimited, has taken place at Tiber Reservoir every year since 2000. The 17th Annual Camp Walleye was the first Cinto had attended. The day of Cinto’s big catch, he was assigned to the boat of Donny and Wendy Roan, friends of his mother who have volunteered at the camp a few years now. It took about five minutes for Cinto to reel in his catch, which he did on his own. Donny coached him through it, while Wendy stood ready with the net. “When I saw it was a big walleye, I thought, ‘If I don’t net this fish, I’ll be thrown overboard,’” she laughs. After a tough fight, the walleye was netted and put in the boat’s livewell. Wendy says Cinto had to sit down because his legs were shaking from both fatigue and excitement. After some time in the livewell, the walleye regained its strength and Cinto held it for a photo op. Then the fish was returned to the water. Everyone was so impressed by Cinto’s achievement that Great Falls Hooked on Fishing not Drugs (Pat’s nonprofit fishing organization for youth) put donations toward a mount of the fish. Tom, who has been carving fish for 25 years, worked from a photo while creating the life-size replica. Cinto is excited to have the trophy, a memory and proof of his incredible catch. “It makes me very happy that they would provide that for me,” he says.